Split Outlook PST Files by Date, by Size, by Year and by Folder. Execute Splitting on newly generated PST file and keep original data intact. Split Journals, Notes, Contacts, Mails, Tasks, To-do-List and Calendars etc. No Limitation on the size of PST files Split both ANSI and UNICODE PST. Require Microsoft Outlook Installation for splitting large size of PST file. Supports all 32 and 64 bit Outlook versions 2016, 2013, 2010, 2007 and 2003 etc. 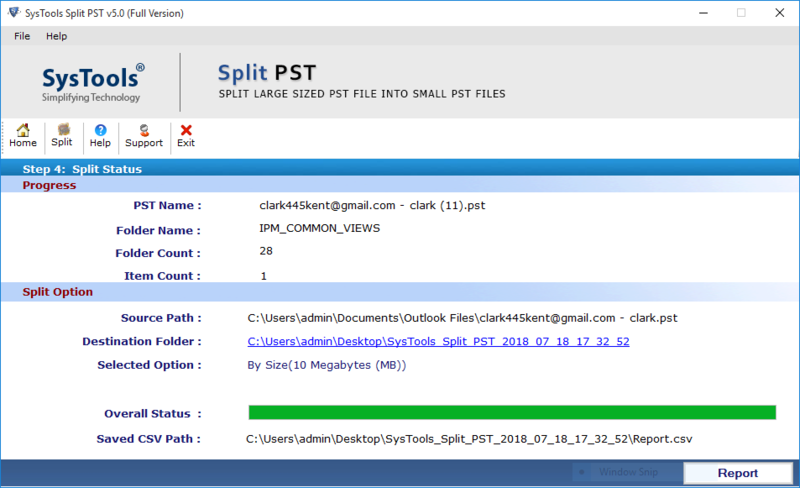 Outlook PST Splitter allows to divide PST files of any size into small fragments. It is viable to divide ANSI as well as Unicode PST files without data loss. Also, tool keeps the meta properties and item formatting intact. PST break tool now supports splitting of corrupted PST files due to oversizing. Although, you can split PST file of size near to 2GB; in case of ANSI file format. But once Outlook data file got corrupted, there is no need to repair it. Split PST by date: Here select a specific date and the software will split PST file by date in two chunks. Split PST by year: This option create a detach the PST file each year for example if you select 2012 to 2013 then you will get three PST files. Split PST by size: Define the size of PST file extent from 5 MB to 10 GB & software will respectively split data files. 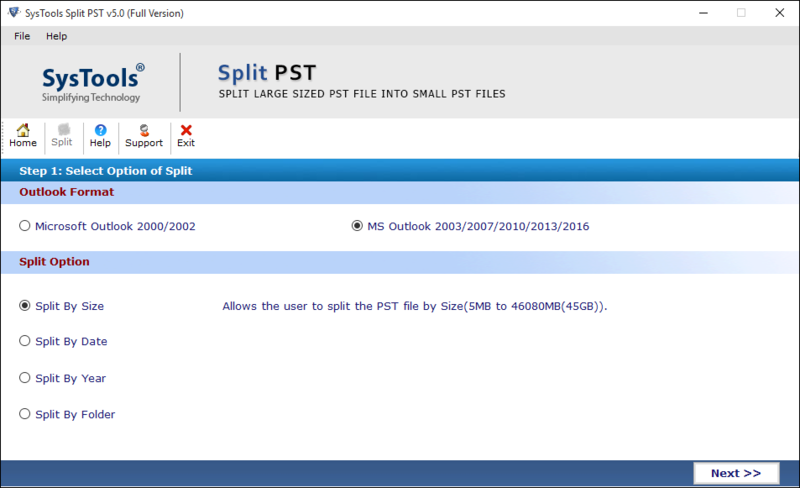 Split PST by folder: PST Splitter create a single PST file for individual folder present with in Outlook data file (.pst). While selecting a splitting option, you need to select an MS Outlook format you are working with. PST Divider supports all versions of Outlook like: 2016, 2013, 2010, 2007, 2003, 2002 and 2000 PST file formats. Thus if MS Outlook version specified by you, software will directly detect the PST file format. After completion of splitting process software will generates and saves a comparison report in CSV file format. This report involve fields like: Folder path, Folder name, Number of items in each PST file folder, difference and sum of items before and after splitting PST file. After Splitting PST file you can save to any desired location. If required create new folder from the software pane and restore files into it. Also, CSV file report of Outlook data file will be created at the similar location by default. 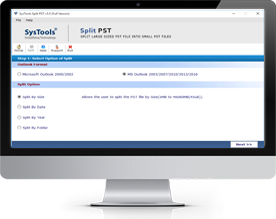 Split PST Software is easily executable with all (32 & 64 bit) editions of Windows operating system and Outlook such as 2000, 2002, 2003, 2007, 2010, 2013, & 2016. Both technical and non technical person can easily operate this software as it is developed with a simple graphical user interface. Quick Overview of Demo Version of PST file Splitter. Split PST by Size: Split only first 50 emails of each PST file. Split PST by Date: Split only first 50 emails of each PST files. Split PST by Year: Split only first 50 emails of each PST files. Step1: Open & Start PST Splitter Software. Step3: Choose From Multiple Option i.e. Split by size, date, year and folder wise. Step4: Finally, View the export report of the complete process. How to Split Large Outlook PST Files? Split Outlook PST file software is so proficient that it will keeps all the data safe & intact while processing. This short video will help to understand how the software split Outlook data files without losing any metadata and the inline images. After watching the complete video, you will get the complete overview of software and its efficiency as well. Does software support to split corrupt Outlook archive files too? Yes, the software is programmed in such a way that it easily recognize and split corrupted or inaccessible Outlook PST files. How to split PST files in Outlook 2016? 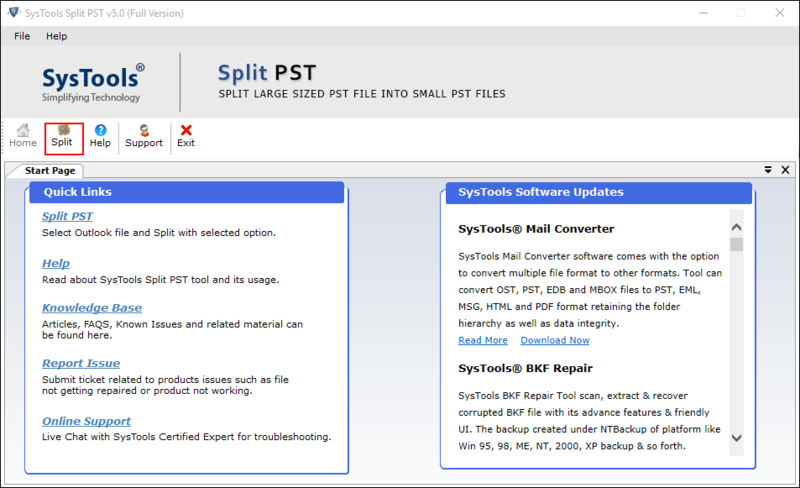 Download & Install full version of Split Outlook PST file tool. Then finally click on Split PST file option to start the process. How can I split Outlook PST files by date? After purchasing the full version of PST Splitter software, you can easily split Outlook PST files by date. This feature is available in demo version of the software as well but there is certain restrictions associated with that. What is the procedure to break Outlook PST file by year? The procedure to break Outlook PST file by year is very simple. You just need to download PST file splitter software and then use Split by year option provided by the software and then select the year to split Outlook PST file. Is there any file size limitation associated with the software? No, There is no file size limitation associated with the software. But there are certain restrictions are associated with the demo version of the software. How can I get the full version of the software? To activate the full version functionality, you need to purchase the software by paying just $49. In few minutes, you will get the license key on your registered mail id.